Your house is your canvas, your home is your art. Isn’t it? Our home is something which is close to our heart. It is our reflection and a place in the world where we are the most comfortable. Every wall of our house has hidden with it a plethora of memories and laughter, and hence, painting it with the right color and shade only enhances its solidness and beauty. 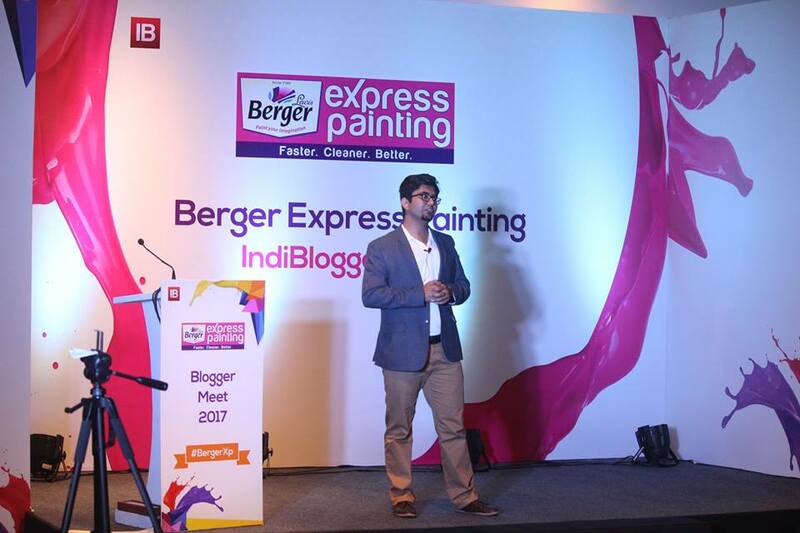 Recently, I had the privilege to attend the Berger Express Painting Indiblogger’s IndiMeet, last Saturday on 11th February, 2017 from 12:30 PM onwards. I was thoroughly excited for the meet as it wasn’t just a bloggers’ meet, but a festival in itself. IndiBlogger has always valued their bloggers and we together have only lived the spirit of blogging and celebrated it. The venue was Vivanta by Taj and the entire place was decorated with vivid colors, celebrating the joy of coloring one’s house and thus celebrating every inmate’s individuality. 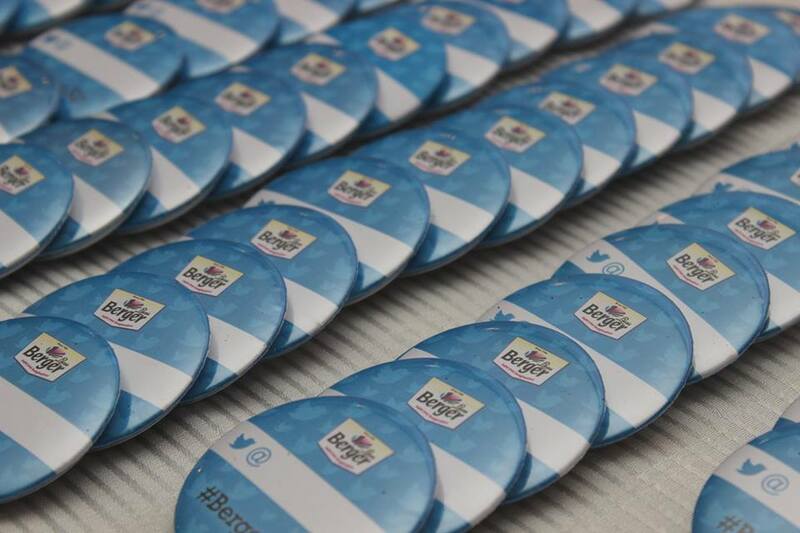 We all were given a Berger XP badge with our twitter handles written on it. The event began with a lot of preens, meets, handshakes, laughter and food. We all were completely overwhelmed by the vibrancy of the ambiance and each blogger who brought along a different hue of optimism and inspiration along with them. The event began roughly around 2 PM and the hall was studded with so much of creativity, colors, glitz and the glamour of blogging. IndiBlogger that it is, we began the session with fun. So, we had a hatke-warmup where we played musical chairs around our tables and mind you, in a very different style. We had to dance around the table in a way and form that reflected us, just like the colors in our home that blend together to warm our hearts. We all agree on how painting our homes is a task! From selecting the colors, tones to the dust that accumulates during painting, it is not just tiring but also hazardous to our health. I’m particularly allergic to dust and prefer to stay away from a dusty place, else I would only end up sneezing the entire while. But, with Berger XP, we definitely have a new-age solution. Thereafter, Mr. Chandranath Banerjee, Service Head of Express Painting presented us with a better solution to providing their customers with a faster, cleaner and better painting experience with the Express Painting Service. 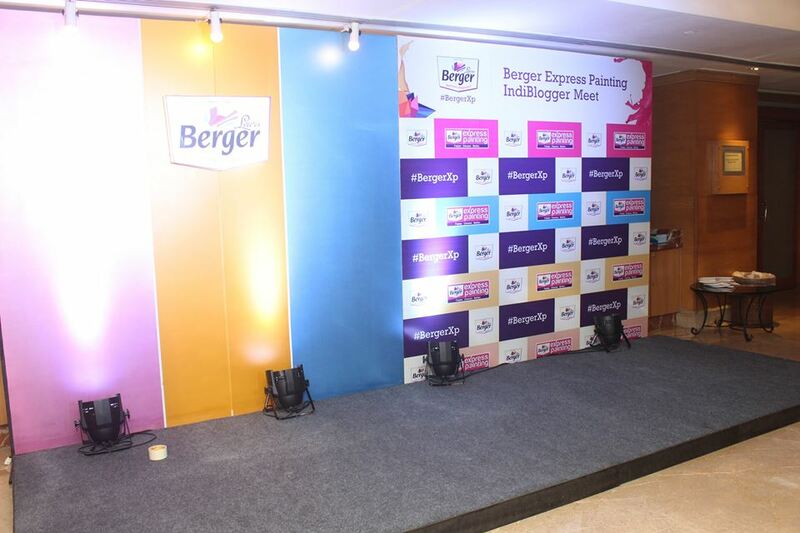 One choose the fast lane with Berger Express Painting! With tools designed to specifically make the process of painting faster and hassle-free, painting is now an enjoyable experience! Say yes to Painting Revolution! 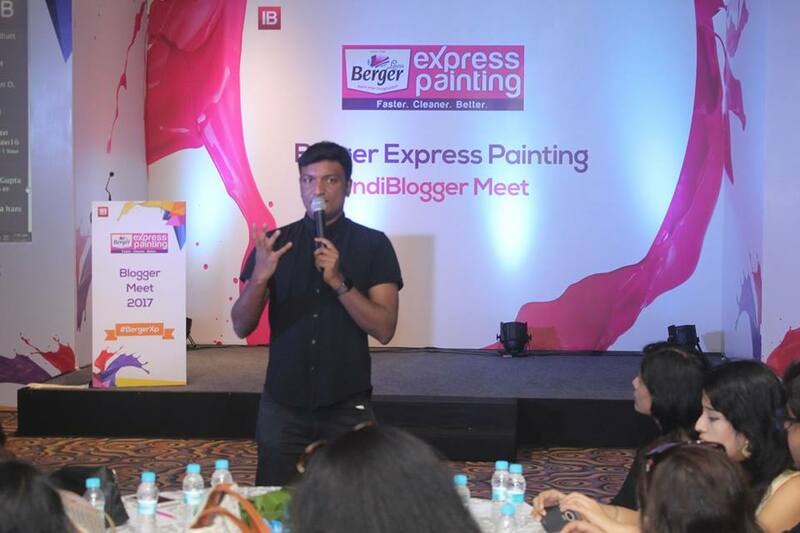 Say Yes to Berger Express Painting! So after a detailed presentation on their newest products like Sanding Machine, Multipurpose Mixer, Auto Roller, High Pressure Washer and Airless Paint Sprayer, we began with blogging fun again. We were divided into a team of 8 and our team was “Paint your imagination“! Where this name definitely suits my creativity and ideas and we were headed with Ekta Khetan as the Captain. The very first activity was on understanding the Sanding process. Though we were all provided with safety measures, the sanding process was a difficult task, as a lot of dust was produced which made us understand the pain that the painting person and the home-mates has to go through during the sanding process. And hence, the eco-friendly products by Berger were not only beneficial for the people in the house, but also quicker and better. Later, after the Tea Break, we had another activity of painting with the colors. We were given topics, “Go Green” and “I love Mumbai”. 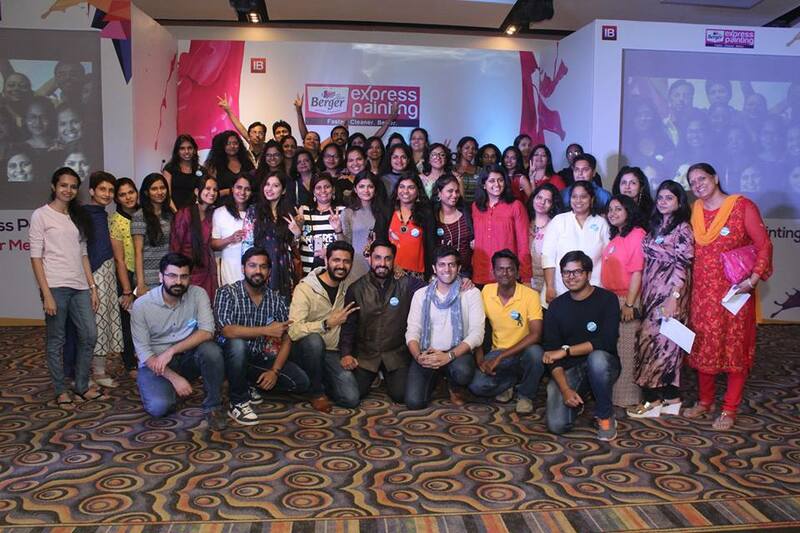 All the bloggers apparently selected the same theme- I Love Mumbai and we all started discussing on the idea. We discussed for sometime and concluded on making a Mumbai Skyline covering the essential historical monuments of Mumbai and clouded them with a “Love Mumbai” in Devanagari and English Script. 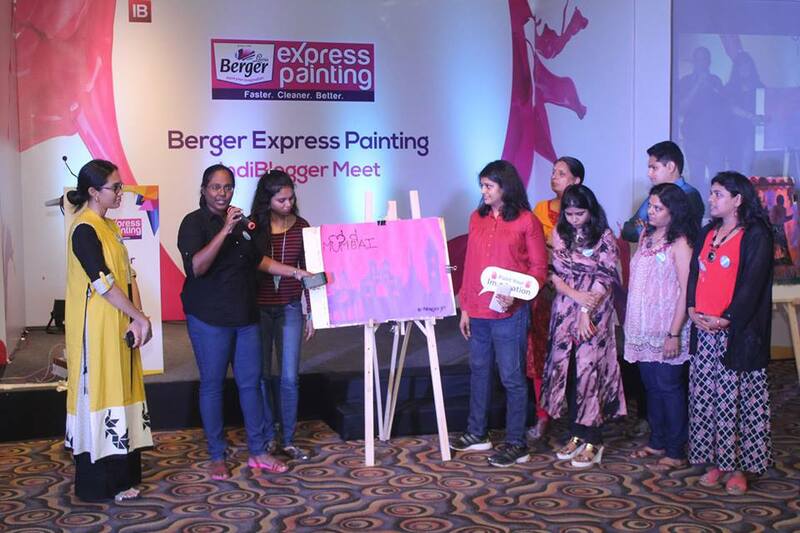 The painting was in a hue of Pink and Purple, thus expressing about how Berger Paints plays an essential role in helping us find peace in our beautiful homes. Since, I was a better painter among us, I started doing the sketching and I was helped by for drawing the layout, while the others mixed the colors to prepare them for paint. Later, all of the team-mates painted the sketch in turns. The painting turned out well. The hall was filled with such beautiful paintings by different teams and I loved how every mind had a different concept and idea for Mumbai. We presented our idea and lo! We won! While there was also another contest where innovative and creative tweets and FB posts won them exciting shopping vouchers, we won a shopping voucher for winning the Painting Task. It was a great event and we ended the session the Indiblogger way! 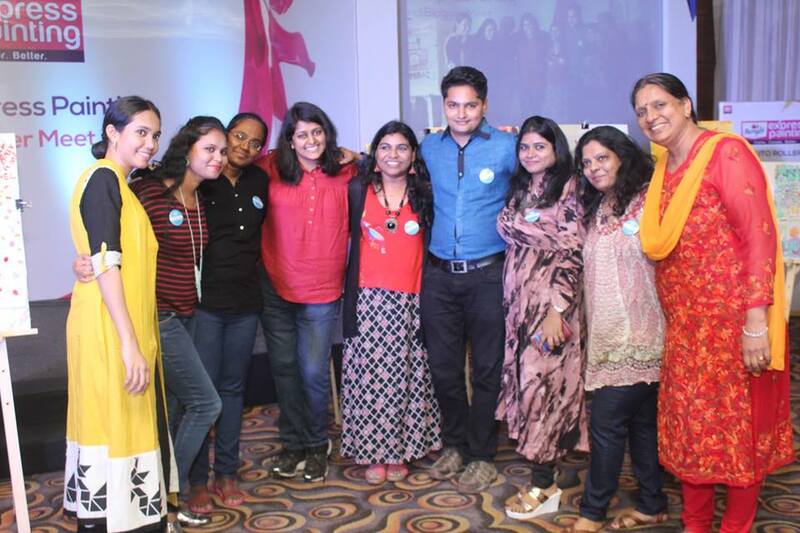 And yes, it was a great time, meeting the bloggers and talking solely about the spirit of blogging!